LNG Partners LLC, of Houston, one of the backers of Douglas Channel Energy, the BC LNG Douglas Channel Project, a partnership between LNG firms and the Haisla Nation, has signed a preliminary deal with Golar LNG for two tankers. On October 10, Golar entered into a 90 day Vessel Charter Option Agreement with LNG Partners LLC (Houston, TX) for the provision of two newbuild LNG carriers under long term contract to deliver LNG production from the Douglas Channel LNG Project in British Columbia (BC), Canada. 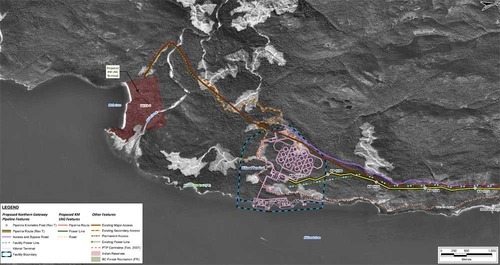 The Douglas Channel Project, in which LNG Partners is an equity owner, is a proposed liquefaction facility on the west bank of the Douglas Channel, within the district of Kitimat, BC. In addition to prospectively providing two vessels, the agreement confers certain preferential rights for Golar to participate in the project with LNG Partners LLC by way of infrastructure investment or LNG offtake. In the same report, Golar LNG reported operating income of $70.2 million for the third quarter of 2012, an increase of 21 per cent from the second quarter. Golar, which has its headquarters in Hamilton, Bermuda, says that since 2001, it has grown from a fleet of six LNG Carriers focused on LNG transportation, to a fleet of 13 vessels (with 13 newbuilds due from quarter three 2013), dedicated to both LNG transportation and midstream floating solutions. The latter means that Golar is working on what the industry calls Floating Storage & Regasification Units (FSRU). LNG is transferred to the FSRU either for storage or where the low-temperature liquified natural gas is heated back to a gaseous state. The FSRU storage tanks are generally made from aluminium. Golar is also moving into Liquified Natural Gas production vessels, that is floating ships that produce the LNG than taking it from a shore-based plant. Golar’s report also reflects the weakness in the LNG markets, a factor that is slowing development of the Kitimat LNG projects. Looking to the fourth quarter, weak Far East demand may result in additional vessels being released into the market, however, with limited available modern undedicated vessels a resumption in interest from buyers could very easily pull rates upward again. New LNG supply will soon be coming to the market with the commissioning of Angola LNG in the Atlantic Basin. Despite delays at the West African project during the third quarter, exports are expected to start early in the New Year. This represents a set-back of about ten months from the original target date for the country’s first LNG project. In the Far East, ConocoPhillips and Origin Energy announced the sanctioning of a second train at its Australia Pacific LNG project. The project is planning to bring the first train on late in 2015 with the second train following in 2016. Both trains will be sized at 4.5 million tonnes. Additionally, during the quarter Chevron made positive statements about proceeding with a fourth train at its Gorgon LNG project in Barrow Island, Western Australia. There are currently three trains at Gorgon under construction totalling 15.6 million tonnes. In addition to Angola, given imminent start-up of the project, supply projects under construction in both the Atlantic and Pacific Basin have reached close to 100 million tonnes, with construction officially beginning at Cheniere’s Sabine Pass LNG export facility. It was the decision by Cheniere to sell LNG to the Far East markets based on North American prices rather than the higher Japanese price that led to a further delay by Apache earlier this year to give the final go-ahead for the Kitimat LNG project. Nuclear outages in Japan continue to stoke demand for delivering Canadian gas to the Far East. Look for oil- and natural gas-fired generation to offset a precipitous drop in atomic capacity as maintenance work at plants, combined with public safety pressures, keeps a fleet of 54 reactors from running at full capacity, the International Energy Agency (IEA) says. Japan’s nuclear reactors normally account for 27 per cent of the country’s electricity demand, but only 16 were online in August, five months after a massive earthquake rocked the coastal city of Sendai and sent officials scrambling in search of alternatives to the atom. The country is one of several potential sales destinations for a suite of liquefied natural gas (LNG) terminals taking shape on Canada’s West Coast at Kitimat, British Columbia. Two of the most advanced proposals, including a 10-million-tonne capacity project led by Apache Canada Ltd. and another, smaller co-operative that would ship 1.8 million tonnes abroad annually, are both seeking 20-year export licenses from the National Energy Board…. The uptick in LNG consumption is potentially good news for a suite of liquefaction plants taking shape on the northwest coast of British Columbia. Japan is one of several potential sales targets for the Apache Canada Ltd.-led Kitimat LNG project, which is currently awaiting approval from the National Energy Board to begin shipping five million tonnes of the stuff annually from a new facility at Bish Cove. Liquefied gas costs spiked 33 per cent after the March 11 quake, Bloomberg reports, and they may rise higher yet. Competition will be stiff. Canadian forays into LNG will rub shoulders with the likes of ExxonMobil, BG Group Plc and Qatargas, among others, who are likewise clamoring to deliver chilled gas to a power market in need. Just 16 of the country’s 54 reactors were online last month, according to the International Energy Agency. (That’s no small figure, as the atom currently meets 27 per cent of the island’s electricity needs). Liquefied natural gas prices are surging to a three-year high as demand from Japan, China and India outpaces supply increases, boosting sales for producers from BG Group Plc to Exxon Mobil Corp…. North America may export about 5 billion cubic feet a day of LNG, or roughly the combined LNG export capacity of Nigeria and Algeria, globally by 2017 from projects that turn surplus gas from shale-rock formations to LNG for shipment to customers in Asia and Europe, according to the Eurasia Group, a New York- based consultant. That’s about half of the six proposed developments by companies including Cheniere in the U.S. Gulf Coast and British Columbia. 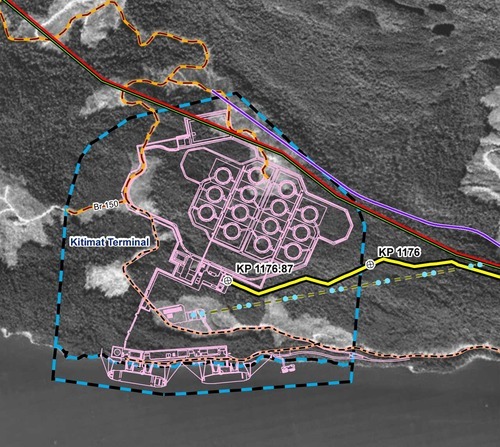 A recent filing by the Enbridge Northern Gateway project with the Joint Review Panel shows just what Kitimat harbour and the service area will look like if the liquified natural gas projects go ahead and so does the Northern Gateway. 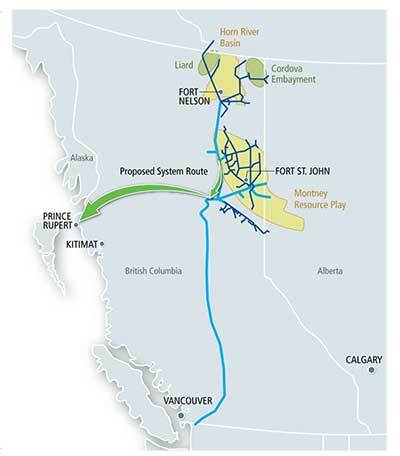 In this map, the Enbridge pipeline is yellow with a black outline, the LNG pipeline is red. Where there are yellow and red alternating squares, that means the two pipelines will follow the same route. Solid orange lines are paved roads,broken orange lines are unpaved roads and the green lines are power lines. Just before the pipelines reach the service centre, they diverge, the yellow Enbridge pipeline following the road route around the periphery of the service centre, while the gas pipeline at first follows the route of the Pacific Trails Pipeline and then snakes off at the hydro substation. 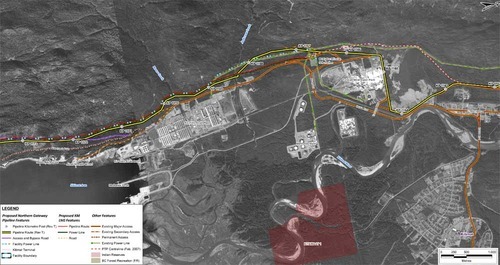 The two pipelines then run parallel just off Haisla Boulevard across from the Rio Tinto Alcan plant. The green line beside the two pipelines marks a hydro line that would be build to power the facilities. 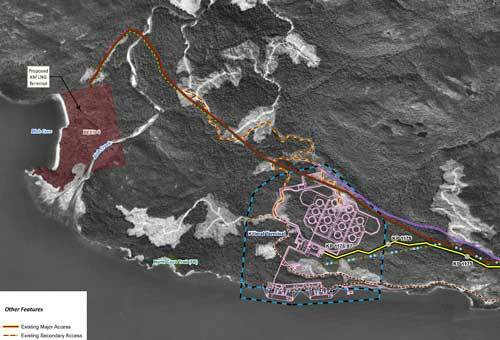 The final map shows the Enbridge pipeline coming into the bitumen/condensate terminal with its large footprint, while the natural gas pipeline continues, crosses Bish Creek and then enters the Bish Cove KM LNG terminal. If the BC LNG terminal is built at North Cove, just west of the proposed Enbridge Northern Gateway facility, a branch pipeline would go from the main gas pipeline down to that facility. (There were indications at the June NEB hearings that negotiations were under way on “sharing” gas “molecules” between the two groups). Footprint of the Enbridge Northern Gateway plant. The Hart Energy E&P (exploration and production) newsletter is reporting that an Overland, Kansas based company, Black & Veatch, a multi-billion dollar, employee-owned engineering firm founded in 1915, is beginning front end engineering (FEED) for the second proposed Kitimat liquified natural gas facility, BC LNG. Black & Veatch has developed a process called PRICO which Tatham says is ideal for this type of application because of its smaller footprint and flexible operations. Black & Veatch’s engineering planning is scheduled to be complete by January 2012 and will provide a “definitive estimate” that will be used for costing engineering, procurement, construction, testing and commissioning of the facility. The newsletter quotes says Dean Oskvig, president and CEO of Black & Veatch “The global LNG export market is extremely cost-competitive,” and Oskvig says the company`s process will be scalable and thus allow the partnership to bring liquified natural gas to market at a competitive price. The Black & Veatch website briefly promotes the PRICO process as simple, flexible, reliable and economic but gives few details. The company has an Edmonton based Canadian subsidiary. Once again under the NEB’s rules of procedure, the hearings will be limited to granting the export licence, with or without conditions and will follow the so-called “market-based procedure” set up for the NEB after deregulation of the oil and gas industry in the late 1980s. The Board will consider, among other issues, the export markets and natural gas supply, the transportation arrangements, and the status of regulatory authorizations. The Board will also consider the potential environmental effects of the proposed exportation, and any social effects directly related to those environmental effects. The public has until Sept. 11, 2011 to register with the board for full intervenor status, request to make an oral statement or to submit a letter of comment. DBRS gave Pacific Northern Gas “Secured Debentures and Cumulative Redeemable Preferred Share ratings… BBB (low) and Pfd-3 (low), respectively, both with Stable trends,” DBRS said a news release dated June 10, 2011. Economic conditions in PNG’s Western system remain weak, but are showing signs of improvement, albeit at a slow pace. Signs of economic improvement in the region include Rio Tinto Ltd.’s (Rio Tinto) announcement of an additional $300 million investment on preconstruction activities for the US$2.5 billion proposed modernization of its aluminum smelter in Kitimat, B.C. ; the proposed Phase 2 of a new container handling facility at the Port of Prince Rupert; and continued modest growth in the oil and gas sector in the Northeast system area. The closure of the West Fraser Kitimat [Eurocan] paper mill in 2010 resulted in some loss of customers in the region, which was offset by the increase in customers in the Northeast system service area. Despite the challenges in the Western system area, PNG has been able to maintain a stable customer base. In the longer term, the competitiveness of natural gas as a fuel and heating source still remains a key focus for PNG, especially in the Western service area; however, residential and commercial electricity rates are expected to rise in the near term according to BC Hydro’s Service Plan. The proposed electricity price increase and current low gas price environment are expected to keep PNG’s delivered natural gas rates competitive with electricity rates in PNG’s Western system. 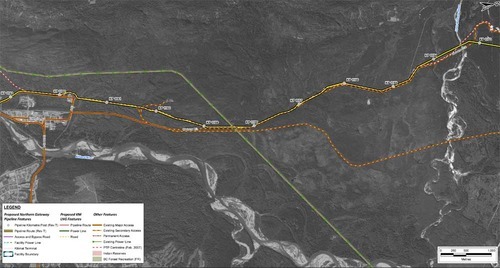 In March 2011, PNG completed the sale of its 50% stake in Pacific Trail Pipelines Limited Partnership (PTP) for a gross consideration of $30 million. The Company has declared special dividends of approximately $22 million, which represents all of the initial payment. A final cash payment of $20 million will be paid if the purchasers make a decision to proceed with the construction of the Kitimat LNG export facility in British Columbia. There is no guarantee that the final payment will be made. Going forward, if the net proceeds from the second payment are retained and reinvested in the Company, this could have a longer-term positive impact on PNG’s creditworthiness. However, the extent of any credit impact will depend entirely on the amounts to be retained and how they are reinvested. But as the Northern Sentinel reported, the BC Utilities commission wasn’t so happy with the dividend, especially when it came to the PNG “transportation charges” it levies on consumers and businesses. The Sentinel says Pacific Northern Gas agreed to pay $500,000 toward the transportation charges to avoid a court fight with the BCUC, after the commission questioned why PNG was not passing on some of the money from the sale to lower the charges. It should be noted that $500,000 is just six per cent of the $30 million net proceeds PNG received for the sale. In the long term, the DBRS report says: “increase[d] utilization on its Western system, [has] the potential to increase PNG’s margins and lower the average cost of transporting gas for all customers.” “Increased utilization” likely refers to the various liquified natural gas projects that may make further use of PNG facilities. As some energy executives have come to realize, but others have ignored, high PNG natural gas transportation charges are one main reason that the industry is mistrusted, if not hated, across the political spectrum from right to left in northwestern BC, a political constituency that goes far beyond the environmental activists. At every public meeting on energy and pipeline issues, there are always questions about the PNG transportation charges, even at meetings on the Enbridge bitumen pipeline, which has little do with the natural gas charges here (although Enbridge is a major consumer natural gas supplier in eastern Canada). At the information meeting in Kitimat earlier this summer, Thomas Tatham, managing director of BCLNG Energy Co-operative, which hopes to build the second LNG terminal near Kitimat harbour, promised that his company, using PNG lines, would absorb the transportation charges for Kitimat consumers.